University of Maine Women's Basketball coach Cindy Blodgett was in attendance to see McAuley take on South Portland. 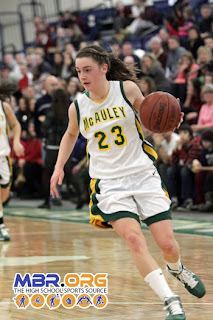 Blodgett was in town to see one of her recruits, McAuley's Rebecca Knight, perform under the spotlight. Knight didn't disappoint, scoring 24 points to lead the Lions. South Portland got off to a fast start, maybe thinking upset in this one. Danica Gleason hit two 3-pointers to give the Red Riots a 7-4 lead midway through the fourth quarter. The word "upset" wouldn't be uttered again in this one, however, as the Lions finished the quarter on an 8-0 run. McAuley continued the run, expanding it to 14-0 as Knight and Hannah Cooke combined for 6 points to start the second quarter. South Portland would go 10 minutes without a field goal as McAuley pulled away. Knight scored 8 points to South Portland's 7 as McAuley led 24-14 at half. It was more of the same in the second half, as Knight and Ally Clement scored 4 points a piece early on. A Danielle DiBiase 3-pointer was the only field goal the Red Riots could muster five minutes in, as they saw McAuley gain all momentum. Knight would finish with 8 points in the quarter to give her 24 for the game as McAuley led 37-20 heading into the fourth quarter.